To recap, last week RBC laid off dozens of employees in favour of hiring temporary foreign workers. What’s worse is before the employees were laid off, they were required to train the foreign workers who would be soon taking their jobs. Many of the laid off employees are in their late 50s and early 60s, too early to retire but too difficult to employ. Prime Minister Stephen Harper responded saying he is concerned at the high growth of the temporary foreign worker program, and promises that reforms are being drafted to ensure the program is being used effectively, and not being exploited. RBC CEO Gordon Nixon issued an apology Thursday, assuring RBC would offer the dozens of laid off workers comparable jobs within the RBC. The temporary foreign workers were hired through iGate Corp, a U.S. based company operating primarily in India, as a result of successful application to the temporary foreign worker program as part of RBC’s outsourcing contract. The Temporary Foreign Worker Program (TFWP) “enables employers to hire foreign workers on a temporary basis to fill immediate skills and labour shortages, when Canadian citizens and permanent residents are not available to do the job”, as laid out on the government of Canada’s website. 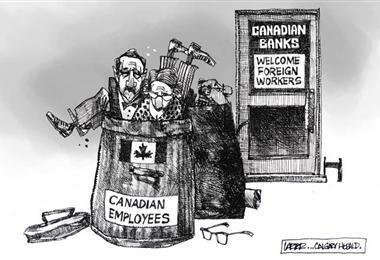 While RBC has come under fire for hiring foreign workers, all of Canada’s major banks have successfully taken advantage of Canada’s temporary foreign worker program in the past. In fact, there were over 212,000 foreign workers in Canada in 2012 and an additional 160,000 who arrived under the federal skilled worker program, according to the National Post. Over 33,000 companies have applied to the temporary foreign worker program since its expansion in 2006, from almost every sector of the economy. Canada’s big banks, major carmakers, mining companies, telecom services, film production companies and universities are some of the major user groups associated with the temporary foreign worker program. The program’s considerable growth over the past few years was unexpected, said Harper. The program was meant to be “absolute and acute”, and obviously temporary, but somewhere down the line those rules were blurred. RBC isn’t alone, HD Mining out of B.C. heads to court this week, to defend itself against two unions who say the 201 positions that were given to temporary foreign workers from China should have gone to Canadian workers. Both RBC and HD Mining feel that they followed the rules according to the temporary foreign workers program, perhaps why Prime Minister Harper has recommended that the program be reformed in Canada’s Economic Action Plan of 2013. The implications resulting from temporary foreign worker disputes have been considerable. Over 54,500 people lost their jobs in March and Canada’s unemployment rate is at 7.2 percent, eye opening statistics, considering the program requires that companies undergo an exhaustive search for Canadian workers prior to using the foreign worker program. Backlash from hiring temporary foreign workers is almost inevitable, primarily coming from union workers. In RBC’s case, the Professional Institute of Public Service of Canada called on its 56,000 members and their families to stop banking with RBC. In the case of HD Mining, the Construction and Specialized Workers union and the Union of Operating Engineers have both dispute the mining companies claims that they underwent an extensive search for Canadian workers before hiring temporary foreign workers from China. Critics of the program argue that hiring temporary foreign workers is usually just a ploy to lower wages, especially when companies are hiring workers for positions that are already filled, as is the case with RBC. Moreover, in many cases, companies don’t need to pay for other benefits. The major issue is hiring temporary foreign workers to fill positions where there are permanent labour shortages. If a labour shortage is chronic, there should be an alternative solution to hiring foreign workers, especially when Canada’s unemployment rate is up to 7.2 percent. In this case, companies should consider hiring foreign workers with the intent that those workers become permanent residents, rather than temporary workers. Prime Minister Harper’s reform is a good step in overhauling the program, but there will inevitably be future cases in which the program comes under scrutiny again. Meghan Tooley is a commerce student and active online blogger from Winnipeg, Manitoba. She often offers her views on human resource development, as it relates to industry trends. She writes on behalf of Metric Marketing, a Winnipeg SEO firm. For more information about careers and recruitment services, visit People First HR Services.